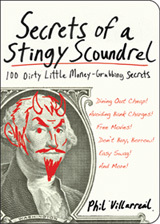 Secrets of a Stingy Scoundrel: Review & Giveaway! It takes an special person to pull something like that off, and Phil Villarreal does so with the shocking grace you can only expect from such a book ;) I still don’t know whether to hug or punch him, but needless to say it was damn entertaining. That’s probably the best word to describe this book: Entertaining. I’m fairly confident that if you were to try and pull off even half of these 100 tips you’d find yourself in jail. Or in an alley somewhere with a broken nose. BUT, a broken nose with an extra $50 in your pocket ;) That being said, there were also a ton of EXCELLENT tips to try out with a good conscience – especially in the first half of the book (the last 20 or so makes you want to take a shower). And 2, well….there is no #2. Just do #1 and you’ll be entered :) And if you’re not feeling feisty enough, just make one up or steal someone else’s tip so you can be entered – whatever works. PS: You can also find Phil on Twitter (where he tweets), Consumerist (where he writes), and The Arizona Daily Star (where he reviews). Thanks for the free books my man! PPS: There’s another giveaway at PF Firewall that ends Wed. @ Midnight, so enter there too. Previous post: So What If People Make Fun Of Our Frugality! Next post: USAA Membership: USAA Now Open To Non-Military Folk!